Not really, in our local culture, though the festivities and the gaiety of the festival is in a way, catching up and assimilating quite well into our culture, or everywhere, around the world, for that matter. Furthermore, there is just so much colors, themes and ideas in dressing up that the whole thing just seemed to seep in seamlessly; on a global scale. When it comes to Fun, everyone is up for it. Anyway, we were not really preparing to celebrate the festival; at least not intentionally. That is, until the stark contrast of colors from dinner last night just hit me. "Is this a Halloween themed dinner?" I asked, as I stared at the dishes all laid out on the table. Yes, that's my unknowing chef, who is just so absorbed in preparing the dishes; in all its simplicity that he overlooked all festivals. The amazing part is how he accidentally and coincidentally whipped up a simple dinner, which just screams of the theme colors of Halloween. Take a look at the dishes, and you will see what I mean. 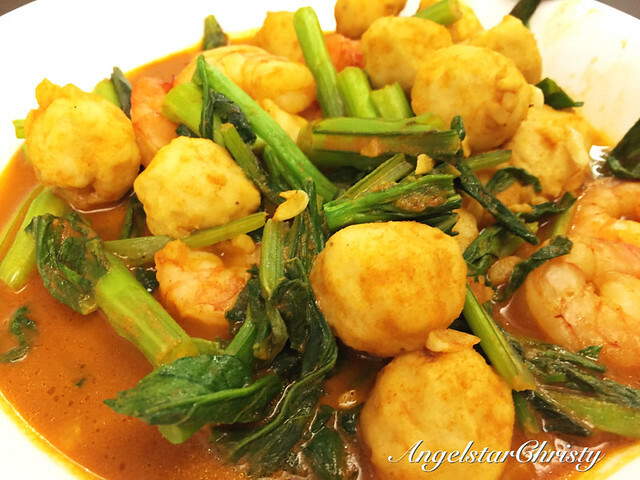 A Curry-based dish; with freshly picked Mustard Leaves (Choi Sum) laden with handmade fishballs and prawns. The colors of this dish are just so vibrant and bursting with bright orange, that it is just so befitting of the Halloween theme. He chose to try out the new Curry powder he bought from the supermarket, and though it didn't go so well with the ingredients, the dish still screams a strong festive theme. Isn't it just a coincidence that he chose to try out the new Curry powder, just right before Halloween? I love the fishballs they have here, they are just so full of that fishy kick and springy flavor that lands in your mouth. They are not flour-laden like most of the fishballs I have tasted, in fact there are times I could even pull out a tiny fish bone (yes, it's a fish bone), so it's definitely fish paste. I could have easily said that I made this (no, really, I have learnt a thing or two about cooking of late, and I will share about my own experiences and experiments soon, I promise), but this is all his work. Experimenting with the garlic seasoning, on my advice (I know, I never thought I could advise anyone on cooking. 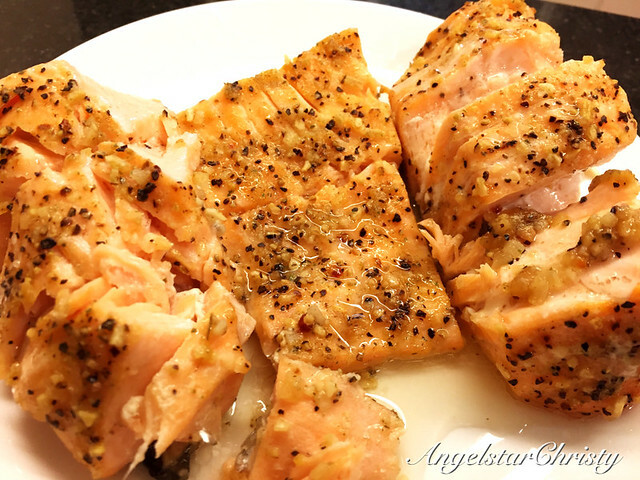 I'm proud), the salmon fillets were carefully marinated before turning on the bake mode. It was really simple, all we need was the microwave to bake this. The basic rule is to keep it between 10-13 minutes to have that rare or medium rare, but approximately 15 minutes to make sure it's fully cooked. 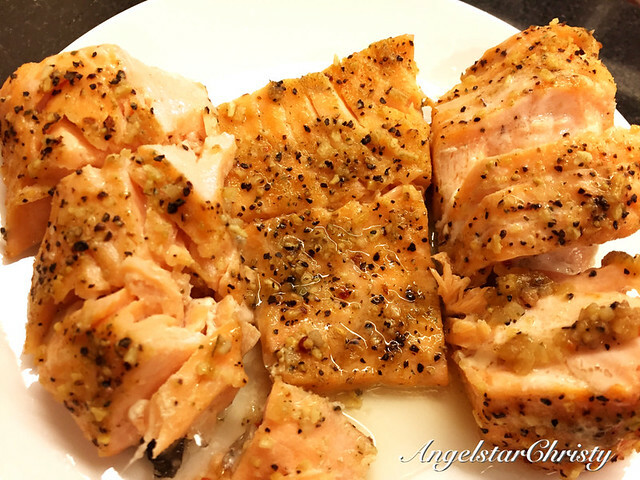 I love the succulent tastes of the salmon fillets (I've always loved salmon anyway), but he spiced it a little with his own idea of sprinkling grounded black pepper along with the fillets, before and after baking. Not too much to make it spicy; but just right to give it that extra flavor of spice which blended perfectly with the juicy salmon flesh. Most of all, again, the color orange just says Halloween, again, doesn't it? Throw in the black pepper, this dish just nails it. The official theme colors of Halloween. To add and to complete the festivity, this is just the final touch to complement the entire meal. The colors again, is just so harmonious with the theme. Stir-fried to a golden brown and that use of carrots just make this such a golden dish. 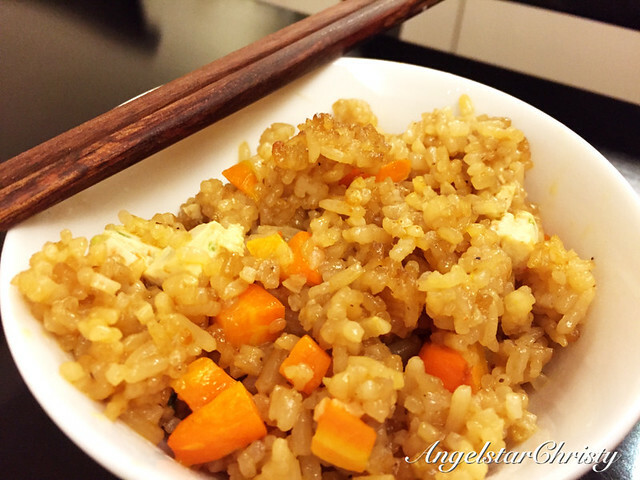 I don't know much about fried rice, so this is not in my learning area yet, but there is one thing I have always heard and known from those who are experienced is that the best fried rice are always made with the leftover rice. For some reason, they taste a whole lot better. I am not sure about leftover or overnight rice, but there is just that distinctive taste when it is left overnight and then frying it on a hot pan. Toss in whatever ingredients you want, and voila, you have just mastered your very own special Fried Rice. It's something my grandmother, my mother, aunts, or anyone who knows how to cook used to tell me. Fried rice is just the simplest thing ever. It keeps you filled and is just so simple to make, that if fried rice is to be a prize dish, then everyone is already a gourmet chef. Well, they didn't say that. Now, can you see why I would have the idea that the whole dinner seemed to be planned with a theme? Almost everything had something orange, or even that hint of orange in it. Well, not a hint, they are practically screaming Orange everywhere. It was just pure coincidence. That we ignorantly and accidentally enjoyed a themed dinner, in time for Pre-Halloween. If I have to pick, this would be the ultimate Halloween dinner dish. 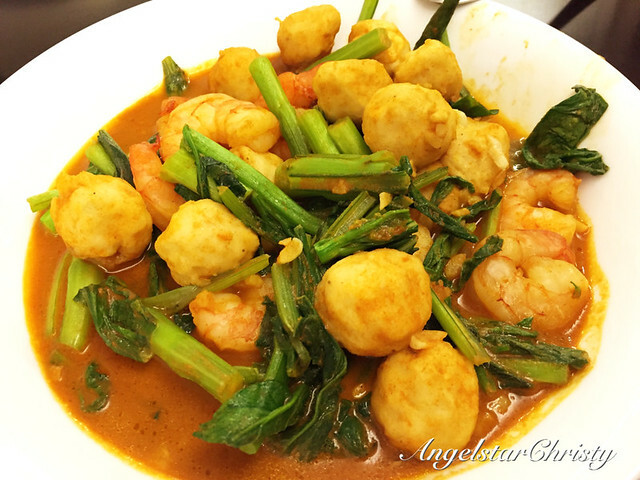 Can we have a encore of this dish? We have just made Halloween feast so local, and just synonymous with our own local style and culture. 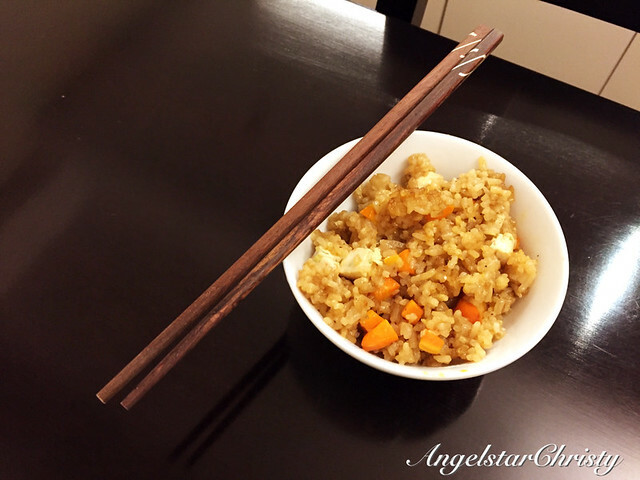 Try Halloween, with chopsticks and Fried Rice! Now, today is like Halloween's Eve, the day before the festive celebration. I wonder if there will another accidental synchronization?